A tea to help you step back, breathe and bathe in the tranquility of chamomile flower and the peaceful bliss of oat flowering tops, fennel seed and marshmallow root. A perfect way to unwind in the evening or anytime during the day. Sit back and let stress drift awaA perfect way to unwind in the evening or anytime during the day. Sit back and let stress drift away. 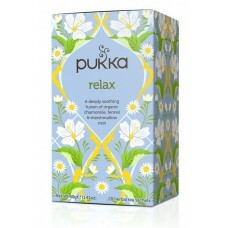 All Pukka teas contain the highest quality organic herbs. It's one of the reasons their teas taste so incredible - good news for taking a moment to reflect and relax.